The Petty Cruisers Visit Perkins! The Cimarron Starlite Cruisers' Car Club proudly feature, great classic vehicles, which belong to the good folks of Oklahoma on this page. 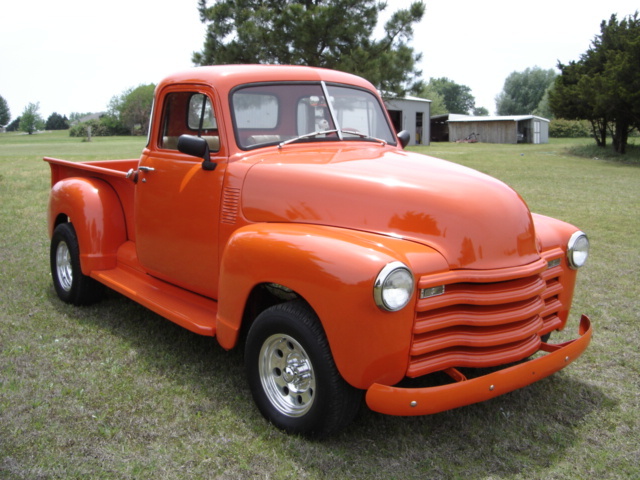 The January 2009 Great Oklahoma Classic is a 1950 Chevrolet pickup restored and owned by Keith and Phyllis Harp of Perkins Oklahoma. Keith has always liked the early Chevy and Ford trucks. After finding an old GMC pickup he decided it needed some major improvements in order to become road worthy and he wanted to drive the truck to area car shows and not take all day to get there! Keith bought a 68 Chevy three quarter ton pickup from a local man that used the truck as a farm truck. The engine had over heated and had been rebuilt by the local Chevrolet Dealership in Stillwater. 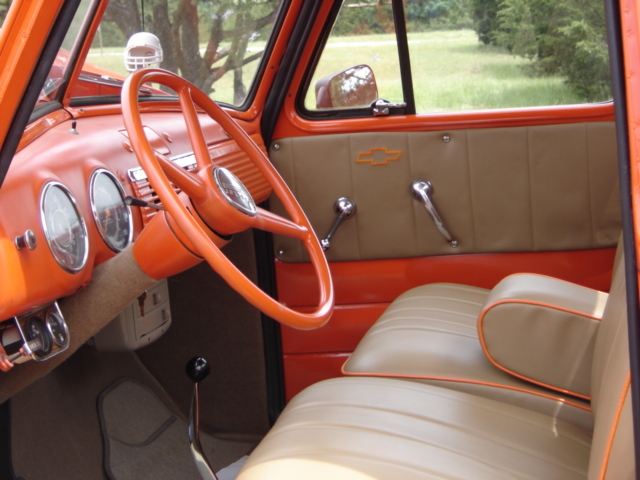 Keith was able to use the steering column, master cylinder, and pedals from the 1968 truck, also. Another guy gave Keith a 1973 pickup rolling chassis, which included front disc brakes and differential. 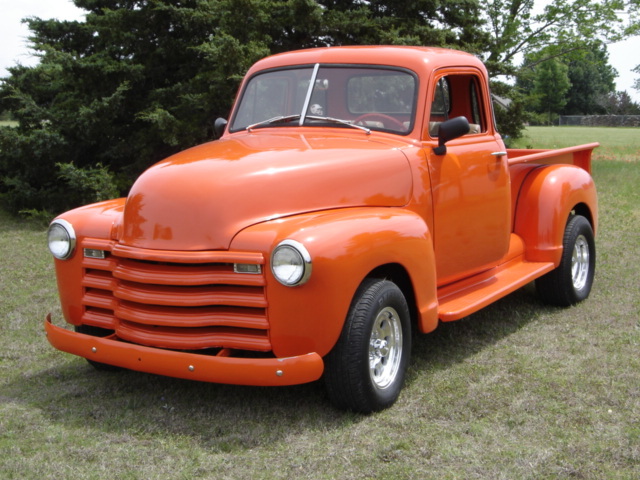 The transformed 50 Chevy pickup now sets on this 1973 chassis. Keith did all the fabrication, cab placement, bed placement and conversion in his home shop. 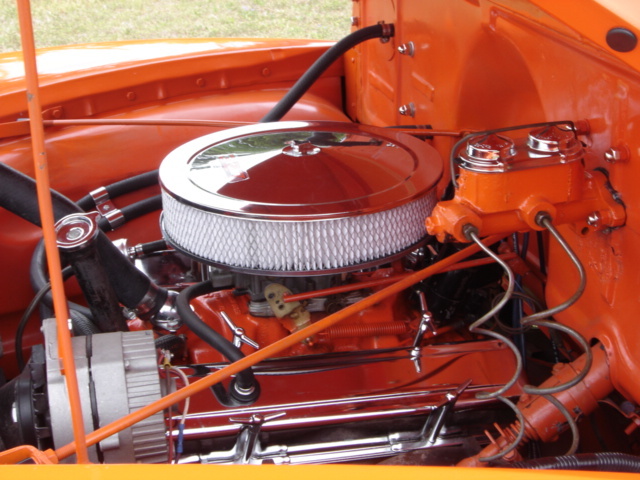 Keith extracted the 1968 rebuilt Chevy 327 V8 from the donor truck along with the turbo 350 transmission to breathe new life in transforming the worn out GMC into a road worthy Chevrolet. Then he added a few chrome goodies to dress up the 327. The upholstery was done by Collin Auto Trim of Stillwater using Keith’s design and ideas. Keith was able to find the perfect seats from a donor car found at J W Lafollette’s Auto Salvage of Perkins. 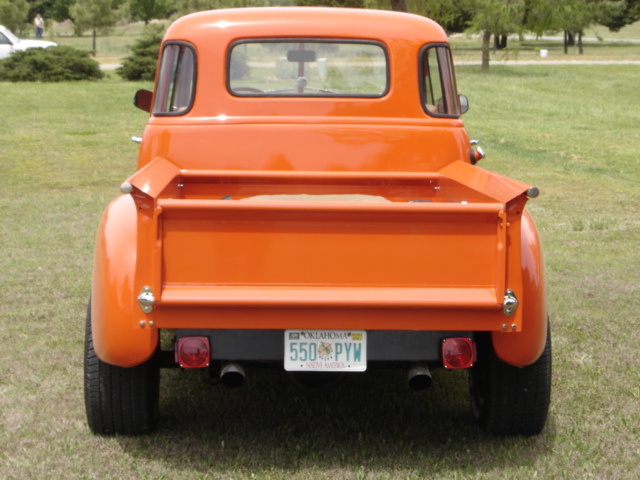 Keith and Phyllis are big fans of the Oklahoma State Cowboys, so they had Perkins Paint and Body paint the classic Chevy Hugger Orange and Max Horton of Stillwater constructed the dual exhaust system. To finish off the conversion, Keith added a great looking set of polished aluminum wheels and he has himself a great 1950 Chevy pickup! 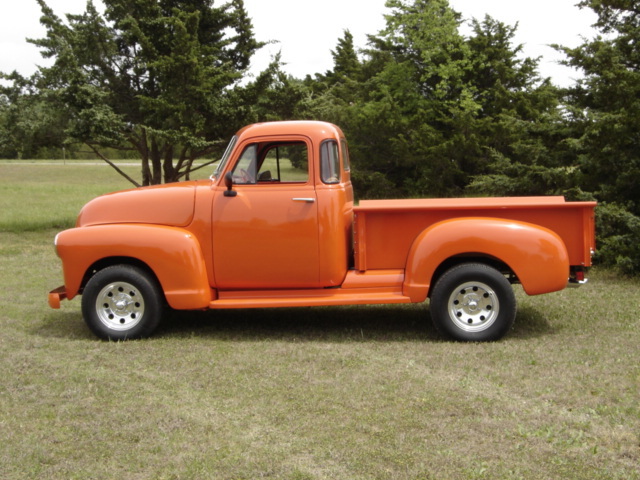 The Cimarron Starlite Cruisers' Car Club is very proud to feature this 1950 Chevrolet pickup built by Keith and Phyllis Harp as the Great Oklahoma Classic January 2009. 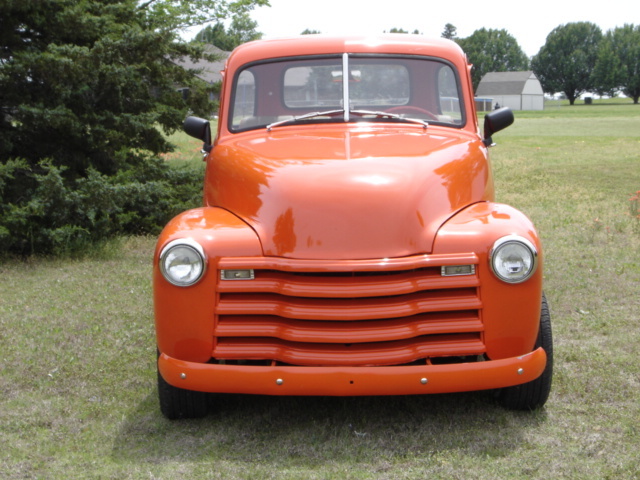 Thank YOU, Keith and Phyllis, for sharing your classic truck with us!